‘Andy Warhol: 15 Minutes Eternal’ is the largest retrospective of Warhol’s artwork to travel to Asia, spanning his career from the 1940s to 1980s. The exhibition is arranged by decade and features more than 400 paintings, photographs, screen prints, drawings, and sculptures. Iconic works in the exhibition include ‘Campbell’s Soup’ (1961), ‘Silver Liz’ (1963), ‘Jackie’ (1964), ‘Silver Clouds’ (1966), ‘Marilyn Monroe’ (1967) and ‘Self-Portrait’ (1986). In addition to his renowned output as a painter and printmaker, ‘15 Minutes Eternal’ includes key examples of Warhol’s films - such as ‘Empire’ (1964), his 8-hour portrait of New York’s Empire State Building - and reveals his continuing influence on younger generations of filmmakers and video artists. The exhibition also gives insights into Warhol’s life and social world through photography and examples of his ‘Time Capsules’ - a serial artwork, spanning a thirty-year period from the early 1960s to his death in 1987, that consists of 612 containers (mainly standard-sized cardboard boxes), which Warhol used to manage the bewildering quantity of material that routinely passed through his life. The exhibition, sponsored by BNY Mellon and jointly presented by PSA and The Andy Warhol Museum, chronicles the breadth of Warhol’s career and demonstrates the scope of his interests. It is planned to travel to five Asian cities over 27 months, and it’s now in Shanghai. 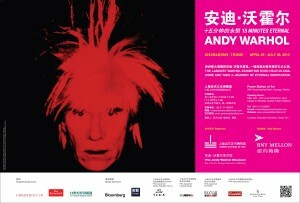 Following Singapore, Hong Kong and Shanghai, the exhibition will then tour to Beijing, and finally Tokyo in 2014. Andy Warhol spent his formative years during the 1930s in a family of immigrants struggling to make a living in America. Like scores before them, Warhol’s parents, Andrej and Julia Warhola, left their homeland in Eastern Europe in search of a better life. Devout Byzantine Catholics, the family regularly attended mass and observed the rich traditions of their Eastern European heritage. Warhol’s parents encouraged the development of his creative talents from early childhood and enrolled him in Saturday art classes at Carnegie Institute, which Warhol attended for about three years beginning in the fourth grade. Andrej Warhola had always intended for Andy to attend college and before he died in 1942 set aside funds for his youngest son’s education. After graduating from Schenley High School in 1945, Warhol enrolled at Carnegie Institute of Technology (now Carnegie Mellon University). After attending college from 1945 to 1949, Warhol earned a Bachelor of Fine Arts degree from the school’s highly regarded Painting and Design Department. During these years, he developed his talent and skill as an artist and stood out among his peers because of his fresh and innovative ideas. New York, and soon found work as a commercial illustrator for Glamour and other fashion magazines. Warhol’s drawings of shoes for I. Miller became a sensational success, and he soon purchased his first house in New York. His mother came to live with him and worked closely with Warhol, becoming one of his assistants along with Vito Giallo and Nathan Gluck. During the 1950s, Warhol established himself as one of the most successful illustrators of his time, winning numerous industry awards including recognition from his peers at the Art Directors Club, the American Institute of Graphic Arts, and the Society of Illustrators. Andy Warhol’s success in illustration was largely due to his ability to create art very quickly and his absolute willingness to respond to the revisions demanded by commercial art directors. By the mid-1950s Warhol earned about $50,000 a year, an incredible salary for such a young artist at that time. After traveling around the world in 1956, Warhol decided that his ambitions exceeded the bounds of the commercial art world. For the first time since his student years, he returned to painting on canvas and began making friends in the contemporary art scene in downtown Manhattan, which embraced new forms in all the arts, including dance, performance, and film. As Warhol devoted more energy to painting, he turned to newspapers, advertisements, comic strips, and other miscellaneous pop culture material for subject matter. In July 1962 Warhol had his first solo show of Pop Art, exhibiting his Campbell’s Soup Can paintings at Ferus Gallery in Los Angeles. The show had just closed when Warhol heard of Marilyn Monroe’s death. Shortly afterward he used a cropped publicity still from Monroe’s 1953 film Niagara as the basis for his now iconic portraits of the Superstar. In 1964, Andy Warhol moved his studio to the Upper East Side in New York. Billy Name, a photographer and artist painted the whole interior with silver metallic paint. This silver-painted studio, known as the Factory, became world-famous as the place to be and be seen in New York City. Here, Warhol made larger paintings, as well as sculptures and films with Gerard Malanga and other assistants. At night Warhol and his entourage congregated at Max’s Kansas City, an artists’ bar on Union Square. By the late 1960s, Warhol’s paintings had become definitive emblems of American Pop Art. His life was marked by frenetic activity, which continued until June 3, 1968 when Valerie Solanas shot and critically injured him. Solanas had briefly appeared in Warhol’s film I, a Man. The 1970s was an incredibly dynamic decade for Andy Warhol. In these years, he created some of his most ambitious paintings and prolific numbers of prints and photographs. In 1973 Warhol moved his studio to a larger space at 860 Broadway to accommodate the activities of Andy Warhol Enterprises. During the studio move, Warhol initiated his series of boxed Time Capsules as a method of organizing clutter. He also began recording his movements and expenses in daily conversations with his secretary Pat Hackett. This account of his life and times was published after his death as The Andy Warhol Diaries. Onassis, fashion designer Halston, actress Liza Minnelli, and writer Truman Capote are well documented in Warhol’s photographs of this decade. Meanwhile, a series of museum exhibitions in the United States and Europe assured his reputation as an artist. Having reached the pinnacle of success in the art world, Warhol chose to collaborate with a number of young emerging artists in the 1980s, including Jean-Michel Basquiat, Francesco Clemente, and Keith Haring. In these adventurous collaborations, Warhol returned to painting with a brush, briefly abandoning the silkscreen method he had used exclusively since 1962. Other new ventures included the launch of Warhol’s television programs, Andy Warhol’s T.V. and Andy Warhol’s Fifteen Minutes broadcast on New York cable television and nationally on MTV. He created work for Saturday Night Live, appeared in an episode of The Love Boat, and produced music videos for rock bands such as The Cars. Warhol also signed with a few modeling agencies, appearing in fashion shows and numerous print and television ads. Warhol’s final two exhibitions were his series of Last Supper paintings, shown in Milan, and Sewn Photos (multiple prints of identical photos sewn together in a grid), exhibited in New York. Both shows opened in January 1987, one month before his unexpected death due to complications from gallbladder surgery. “Fascinated by the glitterati, Warhol remains a complex and often misunderstood person 25 years after his death, whose artwork depicting consumer objects such as Heinz ketchup boxes, and paintings of Marilyn Monroe have been imprinted into our collective consciousness,” said Eric Shiner, director of The Warhol. “BNY Mellon’s global commitment to the arts is designed to facilitate access and deeper exploration of art through the communities in which we live and work. 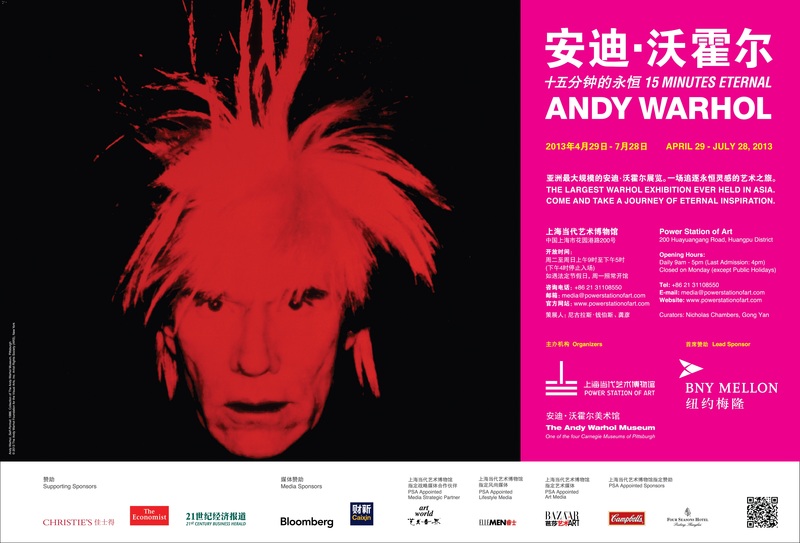 We are very proud to be supporting The Andy Warhol Museum and bringing this remarkable body of work to Asia,” said Steve Lackey, chairman of Asia-Pacific, BNY Mellon. With this exhibition, our museum also organizes a series of comprehensive education projects, such as “Snapshot”, series lectures, children’s art experience activity, silkscreen workshop, and other projects. We especially set up an interactive photo area called “Snapshot”, where visitors could take snapshots of themselves, which will be shown on screens or made into badges so that the visitors can get their own 15 minutes of fame looking like one of Warhol’s portraits in Pop art style.